As expected, Apple has launched a new iPad, and it turns out that that's what the company is calling it. For all the talk of iPad 3, iPad HD and even iPad touch, it seems that the third-generation model doesn't have any new suffix at all. Anyway, the big news is that the updated iPad has a Retina display that's capable of displaying 3.1 million pixels, a new A5X chip with quad-core graphics, a 5-megapixel iSight camera and 4G compatibility. Of these features, it's the display and more powerful processor that should be of greatest interest to music makers. We should be able to look forward to sharper, more detailed apps (though existing ones will need to be updated, presumably) and also more capable ones. Indeed, we wonder if the extra processing power now available might entice one of the big music software developers to do something more serious on the iPad now. However, this does raise the possibility of a two-tier App Store, with users of earlier iPads potentially not being able to run the next-gen music making apps that are designed to push the new model to its limits. That said, the fact that the iPad 2 has dropped in price (£329 now gets you a 16GB Wi-FI model) means that many more musicians will now be tempted to buy one. Apple® today introduced the new iPad®, the third generation of its category defining mobile device, featuring a stunning new Retina™ display, Apple's new A5X chip with quad-core graphics and a 5 megapixel iSight® camera with advanced optics for capturing amazing photos and 1080p HD video. iPad with Wi-Fi + 4G connects to fast networks worldwide, including AT&T's and Verizon's 4G LTE networks, and still delivers the same all-day 10 hour battery life* while remaining amazingly thin and light. Beginning today, iPad 2 will be offered at an even more affordable price starting at just $399. "The new iPad redefines the category Apple created less than two years ago, delivering the most amazing experience people have ever had with technology," said Philip Schiller, Apple's senior vice president of Worldwide Marketing. "The new iPad now has the highest resolution display ever seen on a mobile device with 3.1 million pixels, delivering razor sharp text and unbelievable detail in photos and videos." The new iPad's Retina display delivers four times the number of pixels of iPad 2, so dense that the human eye is unable to distinguish individual pixels when held at a normal distance, making web pages, text, images and video look incredibly sharp and realistic. 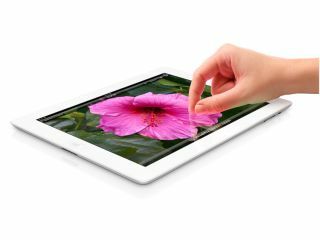 The 3.1 million pixels in the Retina display are more than one million more pixels than an HD TV, and with 44 percent increased color saturation the new iPad displays colors that are unbelievably richer, deeper and more vivid. Movies are now capable of playing at full 1080p HD-resolution, delivering an incomparable viewing experience on a mobile device. With iOS 5.1, the latest update to the world's most advanced mobile operating system, the new iPad has a number of new features and enhancements including: a redesigned Camera app with video stabilization technology; the ability to delete photos from Photo Stream; support for dictation in English, French, German and Japanese; and Personal Hotspot. iOS 5.1 also works seamlessly with iCloud®, a breakthrough set of free cloud services including iTunes® in the Cloud, Photo Stream and Documents in the Cloud, that works seamlessly with your iPhone®, iPad, iPod touch®, Mac® or PC to automatically and wirelessly store your content and push it to your devices. When content changes on one of your devices, your other devices are updated automatically. iPad runs almost all of the over 585,000 apps available on the App Store™, including more than 200,000 native iPad apps, from a wide range of categories, including books, games, business, news, sports, health, reference and travel. The iTunes Store® puts the world's most popular online music, TV and movie store at your fingertips with a catalog of over 20 million songs, over 90,000 TV episodes and over 15,000 movies. The new iBooks® 2 app for iPad lets users experience an entirely new kind of ebook that's dynamic, engaging and truly interactive. iBooks created with Apple's new iBooks Author offer gorgeous, fullscreen ebooks with interactive animations, diagrams, photos, videos, unrivaled navigation and much more. The new iPad Wi-Fi models will be available in black or white on Friday, March 16 for a suggested retail price of $499 (US) for the 16GB model, $599 (US) for the 32GB model and $699 (US) for the 64GB model. iPad Wi-Fi + 4G for either AT&T or Verizon will be available for a suggested retail price of $629 (US) for the 16GB model, $729 (US) for the 32GB model and $829 (US) for the 64GB model. iPad will be sold in the US through the Apple Store® (www.apple.com), Apple's retail stores, and select Apple Authorized Resellers. iPad will also be available in Australia, Canada, France, Germany, Hong Kong, Japan, Puerto Rico, Singapore, Switzerland, UK and the US Virgin Islands on Friday, March 16. Customers can begin pre-ordering their new iPad today, and the incredible iPad 2 is now offered at a more affordable price of $399 (US) for the 16GB Wi-Fi model and just $529 (US) for the 16GB Wi-Fi + 3G model.